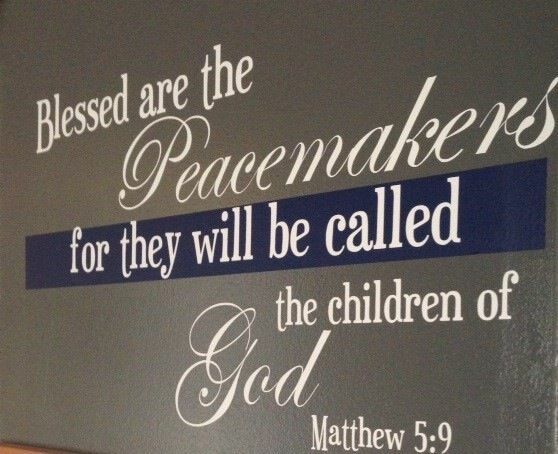 As I said, blessed are the peacemakers, I Am calling you to Make peace, says the LORD. Make peace with your enemies. Make peace with those who have betrayed your trust. Make peace with those who have abused you. Make peace with those who have wounded you, rejected you and spoken evil against you. Make peace with yourself. Make peace with your past and be at peace now. For I AM YOUR PEACE. I have given you PEACE, not just to possess and hold onto but to GIVE. GIVE THEM ME, the author of PEACE, and make peace your mission at all times. Love, joy and peace are My gifts to you, and to perfect them is not obtaining them but releasing them to be active and vibrant and productive. Peace will evade those who do not give it, for stagnation always causes the elements of the darkness of the WORLD to invade and pollute it. Do not let the peace that I give you become dormant. I give peace like a river and it is to flow and be moving and life giving, says the LORD. Be free to love and serve to others what I have freely given to you. My gifts and call for you will not be extracted, but they are to flow from you. Even as I fed the thousands with a few tiny loaves and fishes, I blessed them and broke them and gave the pieces to my disciples to distribute. Do not look at what is given you as inadequate or able to be exhausted. I have given you an endless supply and even after the multitudes were fed, there were baskets of left overs. There is never a time when you will be able to exhaust what I have freely given onto you. Freely give, for there will always be more than enough. As I am EL Shaddai, a GOD that is more than enough, you will have enough to live on, enough to give and there will be more left than what you started out with in the storehouse. If that is not enough, I AM the endless resource that will never be exhausted that is always yours. My storehouses are open to you always. I will be your exceeding great and continual reward and you will have continual and unimpeachable joy as you freely give all things to others that I have given to you, says the LORD.